Plugs into your USB port the first time, no flipping over and trying it again. Patented design allows USB to be plugged in any way you want. Equipped with both Lightning and micro USB connectors the FLYP-DUO is the ultimate cable for Apple and Android users alike. The FLYP-DUO is designed to support the fastest charging speeds possible for all of your mobile devices. The FLYP-DUO is the most convenient cable you’ll ever use. Whether charging or syncing, the patented reversible USB design is always going the right way to easily plug in. The 2-in-1 connector makes the FLYP-DUO compatible with almost any mobile device. Equipped with both micro-USB and Apple Lightning connectors the FLYP-DUO is the ultimate solution for any Apple user who also carries Bluetooth devices or power banks that charge through micro-USB. It is also the perfect solution for anyone who shares chargers in their home or vehicle with friends or family that use different phones. The FLYP-DUO was covered on KTLA's Rich DeMuro Tech Report. 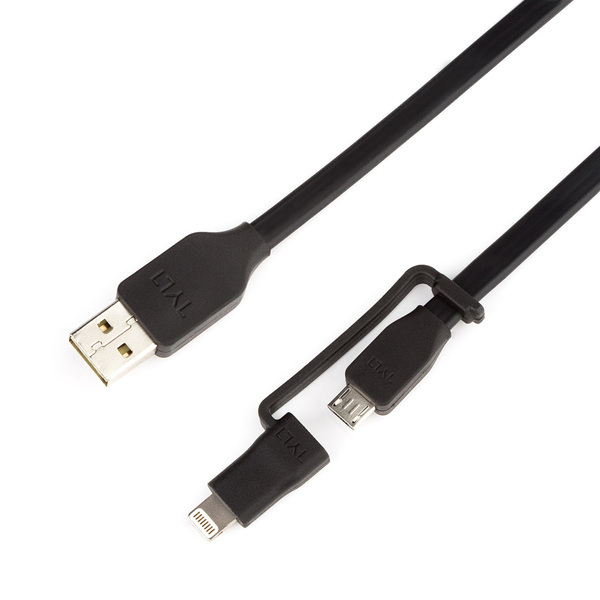 Watch the video to see what makes this charge and sync cable the perfect fit for all tech users!